Oh how I wish you were right. But that is not true. Ticket sales are pretty good. I just checked Ticketmaster and each arena is about 3/4 sold. That is excellent considering the tour does not even start for many months. In addition, the prices are higher than On With The Show. The prices are ridiculous IMHO. But all that means is they will make a fortune on this tour. If you're looking at Ticketmaster then I think you probably got the arena map mixed up. 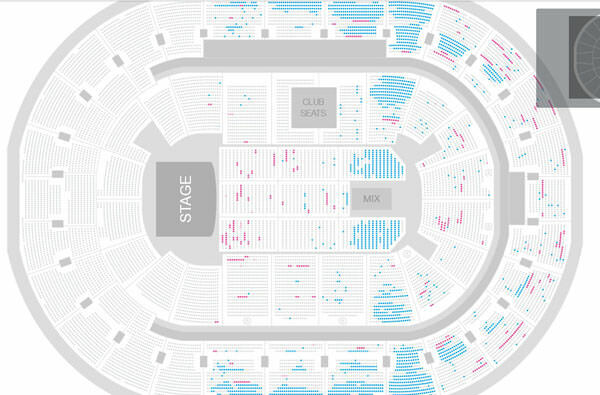 The blue sections are the still available, not the sold. At least at the venues where I've been checking, the sales have not changed much since the beginning. Well over half is still available. He’d do it for the big bag of money. And they (Mick and Stevie, but mostly Mick) will probably call him for a bigger bag of money. Funny how you never talk about Mick and Stevie's endless love for money but you're always ready to point out Lindsey's, when we all know it's not the same amount of love. Richard tweeted some more about it. He said he took the situation harder than anyone and that while the band may continue to work/tour, the "soul" is gone now. He said that to call it "evolving" is being kind. Tulsa looks almost 3/4 to me, but that's freaking opening night. St. Louis... yeah. That doesn't look so good. Because I don’t need to. I pointed out a while ago that when given the choice between Peter Green, his mentor and hero, and money, Mick went with money. It’s nothing new. I’ve also said many times over two decades that I’ve not been a fan of Stevie since 1991. And, I’ve said all five do it for the bag of money, however, Lindsey is the one who actually said it. Some say it with words, others say it with actions. The latter doesn't make it less true. Stevie also said many times that she chose her musical connection with Lindsey over her happiness. In other words, she chose to stay with him because she knew he was her ticket to fame and money. No matter how many poetry you put in what you say, it still means the same. Those are different situations. With what's happened here, I don't think Lindsey would come back regardless of how much money he could make off it and they wouldn't invite him back regardless of how much they could make off it. Too much damage was done here. Unless a miracle were to happen I don't think there's any going back from this, regardless of money. Exactly. I'm sure some shows are selling fine but as a whole this is hands down the worst selling tour (so far) they've had in a long, long time. 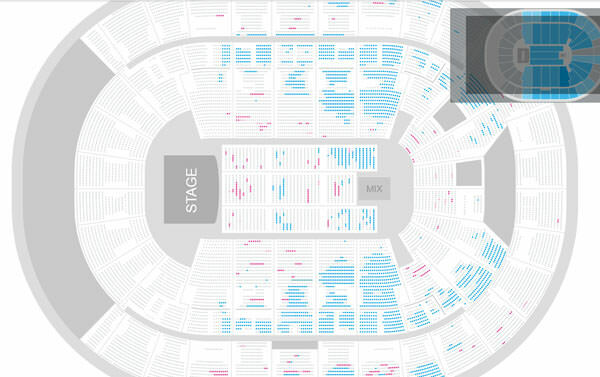 The LA Forum isn't even close to being sold out. And trust me, for that venue, that is RARE. Lindsey deserves to be paid well, as do they all, and I have no doubt that money is a consideration. However, I think he cares about the legacy, too... perhaps moreso. If someone like SteveMacD wishes to believe he does absolutely everything involved with Fleetwood Mac solely because of the money simply because in one interview he talked about doing one of those stupid festival shows for the money, that is his right. I think such an oversimplification of a man's involvement with a group that has defined his life for decades shows a complete lack of consideration of one very important aspect: the heart is more complex than that. I don't think Stevie used Lindsey like that, just as a "ticket" and nothing more. Stevie has said many times that she loved Lindsey, that they were like a married couple. I do think there were times when she thought about leaving him, remembered the music and stayed.... but it wasn't JUST about that. They could have worked together as platonic partners, after all. Like SteveMacD, I think you are oversimplifying the complexities of the heart. Last edited by sodascouts : 07-01-2018 at 10:55 PM. They sold out 5 LA Forum on their last tour. But hey, this is a new band, as Mick so colorfully likes to say it. I don't think Stevie used Lindsey like that. Stevie has said many times that she loved Lindsey, that they were like a married couple. I do think there were times when she thought about leaving him, remembered the music and stayed.... but it wasn't JUST about that. They could have worked together as platonic partners, after all. Like SteveMacD, I think you are oversimplifying the complexities of the heart. I'm just quoting her, that's all. She said she chose her musical connection with Lindsey over her happiness. So she was unhappy but hey, the "musical connection" was so great she chose to suffer in silence! No one does that unless they know something good will come out of it. She also said she loved him "for the right reasons". That was directed at Kristen, but all I know is that she's still by his side when all she has done recently for Lindsey was firing him. I find it very hard to believe she fired him just because she loves him. Out of curiosity, I did a little sampling - with a few exceptions like Chicago, NYC, and Phoenix, sales seem pretty to be pretty much what John Run was talking about... except for the South. They seem to be selling well in the Deep South, for the most part. Maybe it's because so many big acts only come to Atlanta and Nashville, and therefore when Fleetwood Mac does come to places like Birmingham and NOLA, it's going to sell well regardless. Last edited by sodascouts : 07-02-2018 at 12:02 AM. I don't think anyone was asking you to believe that. Surely most would agree that this is like being in 1987 and trying to talk about the potential for a Dance reunion in 1997. It's simply "too soon" to address the probabilities of various hypotheticals. Look what happened between 1987 and 1997--playing for POTUS, addiction turnarounds... the world changes, the individuals change (somewhat), so anything could happen. On the question of whether some sort of reunion/resolution between LB and FM/SN should be something that eventually happens--my answer would be: whatever they (particularly Lindsey) can live with. If circumstances conspire and he deigns to reconnect with them again because that would ultimately be easier for him to live with than carrying around a grudge, then good for him. There's the view that the others are already suffering some solid punishment for their decision (squirming in the awkward interviews, apparently floundering to fill arenas, enduring fan backlash). Whilst she may have said she stayed with LB longer than she wished due to their musical connection, it's not fair to assume she never loved him at all. There's clear evidence and other interviews she has given that supports this.